Do you ever know that you are going to absolutely love something even before you eat it? Yeah. I knew I was going to love this cake! I have been craving it since I saw it and couldn’t wait to make it. The strawberries are looking better in the store lately, so I snatched some up and knew I needed to make this. Every layer of this cake was amazing. From the moist cake layer, to the cream cheese layer, to the strawberry layer and then topped with the streusel on top! I mean how could you not fall in love with this cake!? I loved everything about it and it became an instant favorite. I will definitely be making it again! 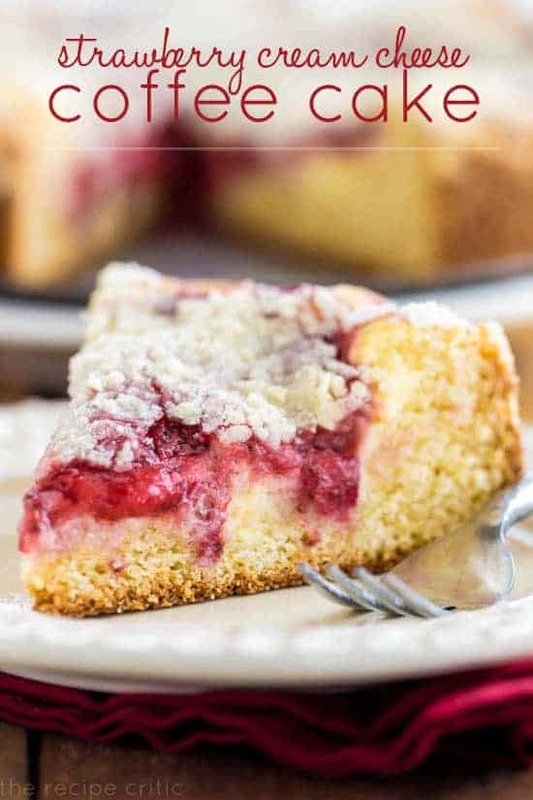 Delicious coffee cake with a cream cheese and strawberry center! Preheat oven to 350 degrees. I used a 9 inch spring loader pan. Spray with cooking spray. An 8 inch pan will also work, the cake will just be thicker. To make the jam: In a medium saucepan combine strawberry pieces and sugar. Cook on medium low until the strawberries release their juices. In a small bowl combine the water and cornstarch until it makes a slurry and add it to the strawberries. Continue to cook for about 5 minutes until it thickens. Remove from heat. To make the cream cheese filling: Beat the cream cheese until it is smooth. Add the sugar, and egg until it is combined. Set aside. To make the cake: Combine the flour, and sugar together. Then add the small chunks of butter and cut it in using a pastry cutter or two forks until the mixture is coarse crumbs. Measure ¾ cups of the mixture and set aside to use for the crumbs on the top. Add the baking soda, baking powder, and salt and mix well. In a seperate bowl, beat the sour cream, egg and vanilla until it is well blended. Gently stir this into the flour mixture until incorporated. The dough will be lumpy and thick. Spread the batter into the bottom of your greased pan. You want to spread it so that the sides are a half an inch up. Pour the cream cheese in the center and spread until it is about 1 inch from the sides and be careful not to go past the boarder. Spread the strawberry jam on top of the cream cheese layer. Then sprinkle the ¾ cup reserved crumbs on the very top. Bake for for 50-55 minutes. Cool in the pan on a wire rack for about 20 minutes before serving. This looks absolutely delicious! I’m afraid I wouldn’t want to share a single bite with my family! This coffee cake looks AMAZING!! I am drooling at all that strawberry, cream cheese goodness!!! I made this cake in the summer, it was the best cake ever. Every one loved it and not a grain was left over. Thank you. Do you have a similar recipe for a pumpkin cake (using sour cream & cream cheese like this one)? I would love to make this kind of cake with pumpkin for Thanksgiving. If you have such a recipe, kindly publish it soon. I want to make this tonight for tomorrow morning…do I bake tonight or do I pre assemble and bake in the morning? I don’t want to wake up at 4 am to bake if I can avoid it.